I want to thank you for taking time to check out the RVC website. I want to introduce myself. 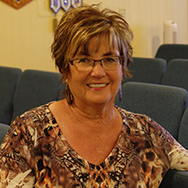 I am Pastor Susan Henard. I am the Senior Leader here at River Valley Church. When I was just 13 years old I met the boy of my dreams Greg Henard and a few years later we were married. We were married for 47 wonderful years before the Lord called Greg home. I have 2 sons, Michael and his wife Cindy, Steven and his wife Melanie and 3 awesome grandkids, Kaitlin, Kody and Conner. I also have a beautiful loving dog named Ruby. I was radically saved at the age of 38 and I have never been the same since Jesus came into my heart and life. In 2006 Greg and I became the Senior Leaders of the church. After the Greg went home to be with Jesus the church asked me to stay and continue as the Senior Pastor. I absolutely love my church and the calling God gave me for our city and surrounding communities. One thing you should know is that I love all people and my desire is for everyone to know Jesus. Going outside the 4 walls of the church is a passion of mine. I love taking Jesus into the marketplace. Some fun facts about me. I have lived in my same house for 48 years on 10 acres just down the road from my son Steven and his family. I love horses. I share that passion with my granddaughter Kaitlin. I love the beach, taking my chair and sticking my toes in the sand with a good book and a Pepsi. God blessed me with good friends that I love to hang out with. I don’t like to cook. I love sitting in my yard in my porch swing. I really like a good Hallmark movie on a cold winter Saturday because they all have happy endings. I love watching the kids in my church play sports. I try to attend as many of their games as I can. I love life and oh yeah I really don’t like housecleaning either but unfortunately someone has to do it.